Uttapam is a dosa-like dish that is made by cooking ingredients in a batter. The batter is made of a 1:3 ratio of urad dal and rice (1:1 ratio of boiled to non-boiled rice) that has been fermented. 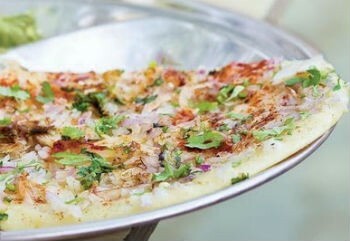 Instead of making it like a crispy crepe, uttapam is thick and not filled, with ingredients cooked right into the batter. Uttapam is traditionally made with tomatoes or an onion-chilli mix; other common ingredient choices are coconut or mixed vegetables. 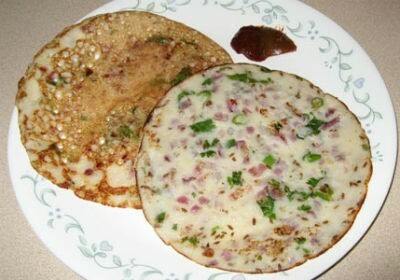 Uttapam is sometimes called an Indian pizza or pancake. 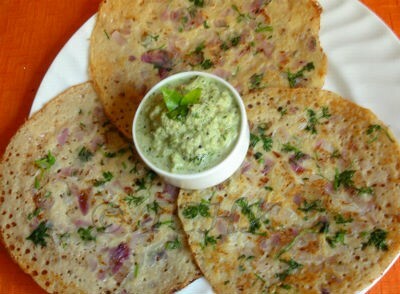 We have 25 Uttapam recipes in this category. Here are the most popular Uttapam recipes from Awesome Cuisine ever.